Newport, Rhode Island hosts the largest group of private yachts available for charter in New England the summer season. Newport is also home to Northrop-Johnson Yacht Charters. And Newport is only 22 nautical miles from Block Island, which is a great stop on a crewed yacht charter itinerary. One unique aspect of Block Island is the large interior bay or the Great Salt Pond, as it is referred to locally. This body of water was a large salt pond until a channel was dug in 1895 connecting the pond with the ocean. This is the perfect anchorage for visiting yachts with well protected waters. In the Great Salt Pond, there is plenty of space to anchor and several marinas, if docking is your preference. In fact on busy summer days, the Great Salt Pond has been known to accommodate over 2000 boats, of various sizes. 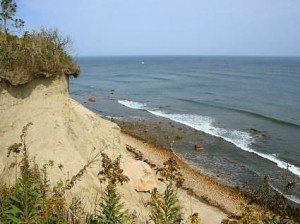 Block Island has few year around residents, but the population swells in the summer with visitors. Downtown New Shoreham, the island township, and where the ferries dock, is a bustling few blocks, anchored by several large summer hotels that used to cater at the turn of the century to summer visitors. The largest original hotel is The National, now on the National Register of Historic Places. Drop by and you will still find rocking chairs on the long front porch of this old hotel, which is a great place to sit and take in the ocean views. There are several blocks of stores and little shops to visit. Rent a bicycle and ride around the rest of the island, which is still fairly uninhabited, and covered with wild roses. 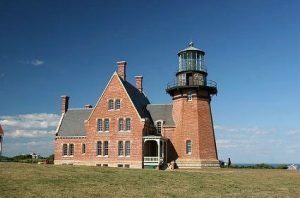 Block Island is one of 12 sites listed on the Nature Conservancy list of “The Last Great Places” in the Western Hemisphere. Over 20% of the island has been set aside for conservation, and is a great location for bird watchers, as Block Island is one of the natural stopping points for birds along the “Atlantic Flyway”. Racing sailors may know of the island and even visited for Block Island Race Week an annual event, for various classes of racing sailing yachts. 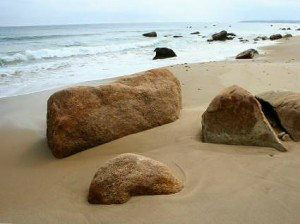 In odd years Block Island Race Week is held by the Storm Trysail Club, a famous club for serious sailors. On even years, Block Island Race Week is held by the Block Island Race Week Organization, however whichever year it is, Block Island Race Week is a weeklong event with a series of day races for many classes and even a race to circumnavigate the island.